Harley Quinn’s loveable hyenas can usually be seen in her and Joker’s hideout in Batman: The Animated Series and in the comic books. It looks like audiences will soon get to see the two wild carnivores in the upcoming live-action film, Birds of Prey (And the Fantabulous Emancipation of One Harley Quinn). Yeah, that title is a mouthful. A set photo has surfaced that gives us an idea that she’s out shopping for the hyenas. In the photo, we see Harley Quinn visiting Murray’s Exotic Animals pet store. In the comics, the hyenas are named Bud and Lou, which are inspired by Abbott and Costello. 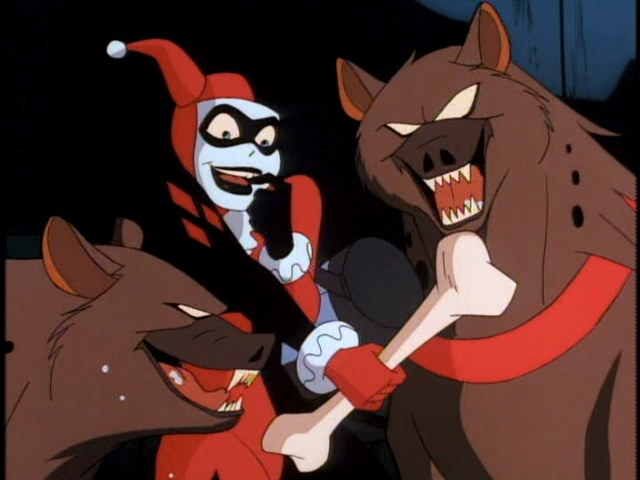 The hyenas and Harley Quinn first made their appearance in Batman: The Animated Series. Since then they have been featured in comic books. Birds of Prey is based on the comics featuring the female heroes of Gotham like Batgirl, Black Canary, Huntress, and Lady Blackhawk. The film is being directed by Cathy Yan and stars Mary Elizabeth Winstead as Huntress, Jurnee Smollett-Bell as Black Canary, Rosie Perez as Renee Montoya, Ella Jay Basco as Cassandra Cain, Chris Messina as Victor Zsaz and Ewan McGregor as Black Mask. Birds of Prey (And The Fantabulous Emancipation of One Harley Quinn) hits theaters on February 7, 2020. Until then, you can catch the standalone Joker movie in theaters on October 4, 2019. The post Set photo hints at Harley Quinn’s pet hyenas in Birds of Prey film appeared first on Nerd Reactor.